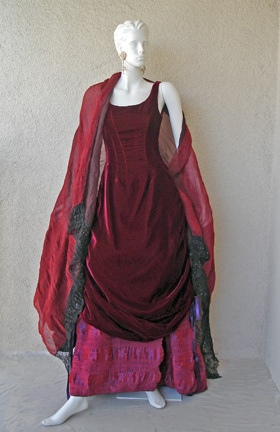 Rare collectible and wearable Christian Lacroix blood red garnet velvet bustle gown w/matching shawl that simply takes your breath away! Featuring all of the designer's signature elements he has always used to seduce his audience of faithful fashionistas. 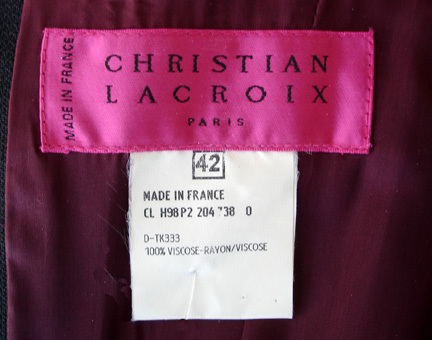 In the early 80's Christian Lacroix was hailed as the new emerging designer of contemporary Haute Couture. And when he opened his own House in 1987 there was no doubt that his extravagant lavish and exotic 'larger than life' creations made the House of Lacroix the mecca for the new high society of the 1980's. 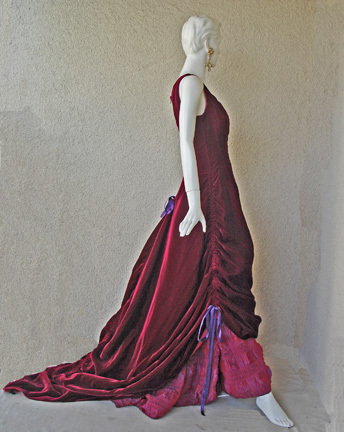 Lacroix has no boundaries in his artistic interpretation to create fashion; fashions that have no limits in terms of expense and larger-than-life volumes and volumes of exquisite brocades and patchwork silks. Lacroix designs the most impressive, unique and astounding ballgowns that one can only describe as 'masterpieces'. Reminiscent of royalty at the French Court at Versailles it's easy to see where Lacroix begets his inspiration. 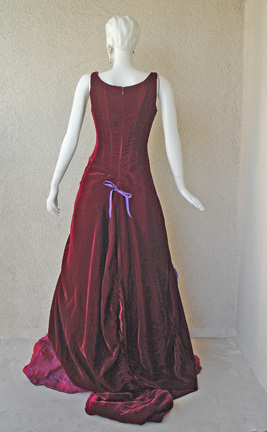 This gown is no exception..
Sleeveless corset bodice boned with princess seaming. 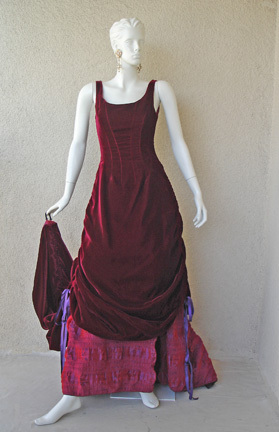 Draped skirt has long ruched seams with purple ribbon ties adjusting the length of the velvet overskirt. 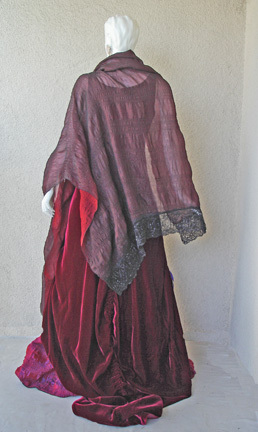 Underskirt is constructed of a contrasting heavy silk taffeta overlaid on heavy black silk organza. 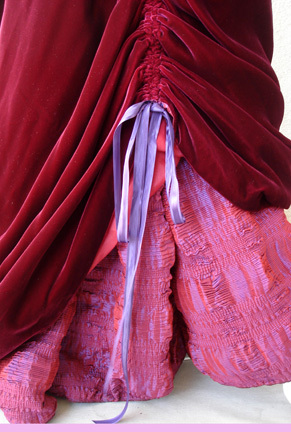 Peek-a-boo hand ruched hemline for support and a flavor of old world opulence. 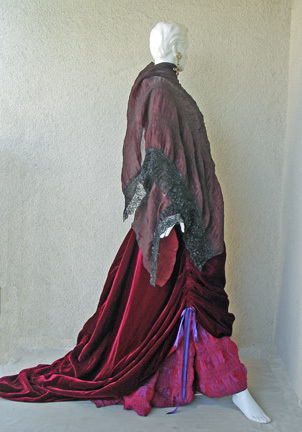 Magnificent huge train can be worn trailing or can be hand held with hand loop. Matching two-toned puckered silk shawl shot with hints of metallic threads and adorned with black chantilly lace completes this signature opulent over-the-top Christian Lacroix ballgown. 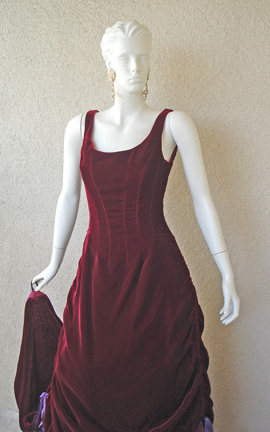 Condition: brand new condition w/tags from Neiman Marcus on both pieces. Does not include the Lacroix cross earrings on mannequin.